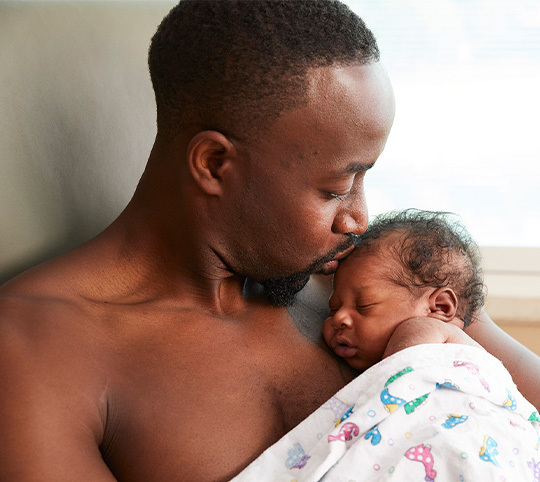 Skin-to-skin time is when baby snuggles on mom or dad's bare chest. 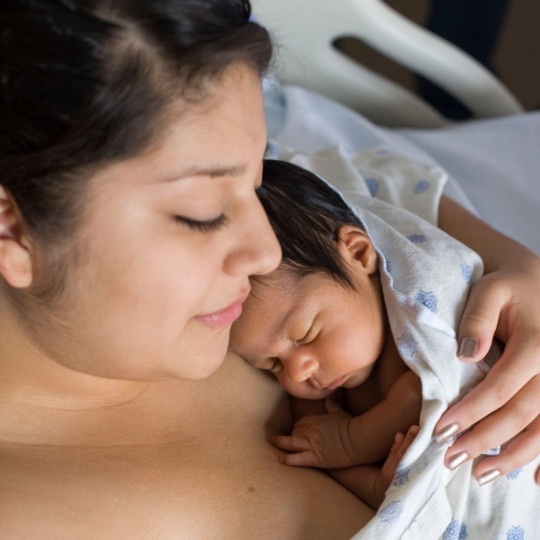 Skin-to-skin is good for all babies, whether they are breastfeeding or formula feeding. Releases hormones that relieve stress and stabilize baby's temperature, breathing rate, heart rate, and blood sugar. Releases a hormone that lowers mom's stress and promotes healing. Helps your colostrum (the first milk that is full of nutrients that protect baby) to flow more easily. Boosts baby's immune system and protects against illness and disease. Builds a strong brain through the smells, textures, and sounds the baby experiences while he's on mom or dad's chest. Helps baby gain weight faster. Helps mom breastfeed longer by building her milk supply and making her bond with baby stronger. Lowers mom's risk of postpartum mood disorder. Creates connections between mom, dad, and baby that last a lifetime. Gives mom a chance to rest or take a break. The first hour after delivery is called the Sacred Hour. It is a special bonding time that begins when your baby is placed skin-to-skin on your chest right after he is born. Your heartbeat will calm your baby, and he will smell your breastmilk. You should keep doing skin-to-skin time with no interruptions until your baby finishes his first feeding. What Happens During the Sacred Hour? If your baby has any trouble latching and breastfeeding in the first hour, it is very important that you use your hand to remove some colostrum from your breasts. This early stimulation will help get your milk supply going even if your baby wasn't able to suckle at your breast. Breastfeeding exposes your baby to new germs, and your milk has antibodies that fight against those germs. It's like giving your baby his first immunization! Make skin-to-skin part of your birth plan. Talk to your doctor and hospital to make sure they support skin-to-skin time during the Sacred Hour and in your room. 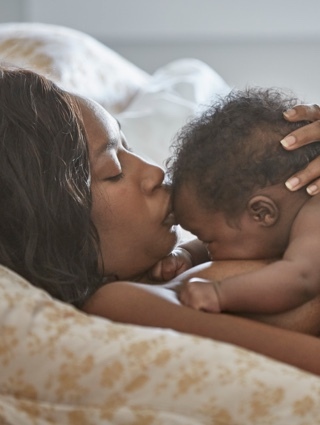 Skin-to-skin helps mom and baby get off to a good start with breastfeeding. Ask your hospital if they offer skin-to-skin after cesarean section deliveries if you and the baby are alert and stable. Dad may want to wear a shirt that can be unbuttoned so he can easily snuggle baby skin-to-skin. Let family and friends know about your plans. Tell them whenever you need privacy for skin-to-skin time in the hospital and at home. There's no specific age when skin-to-skin should stop. It provides powerful benefits for baby the entire time he is an infant. Save skin-to-skin for those times you won't fall asleep. If you fall asleep, you can easily block baby's airway. Ask your partner, grandma, or a nurse to watch over you and baby right after you deliver, as you will likely get very sleepy. Keep baby in an upright position (his head higher than his feet). Adults who hold baby should sit semi-upright with a pillow behind their back. Make sure baby's head is turned to the side with his nose up in a sniffing position so he can breathe easily. Dress baby in a diaper and cap. Place blankets over baby's back to keep everyone warm and cozy. Don't let the blankets cover baby's nose or mouth. It’s important that your baby is positioned right, so that she can get all the milk she needs. 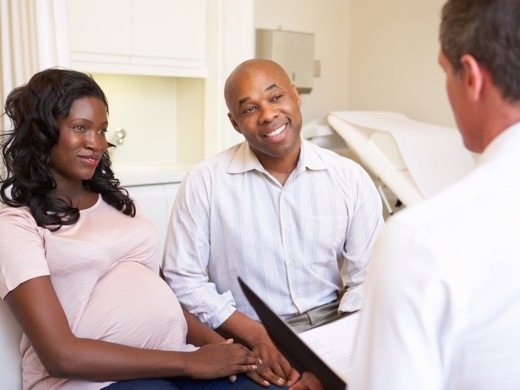 Deciding on the right hospital or birthing center can be just as important as finding the right doctor. Breastfeeding has benefits that last a lifetime, and it is good for both mom and baby.